Note from Kavita Favelle: La Lotta was our favourite restaurant (until it closed late in 2008). My husband and I ate there a couple of times a week and many of our friends loved it too. We were huge fans of their tiramisu which was much lighter than traditional, cheese-heavy recipes. Eva Tomova kindly demonstrated the recipe and allowed me to take photographs and notes. She was taught in turn by Bob Moskovsky, the restaurant manager. Some of the measurements are approximations and the wording of the instructions and any inaccuracies therein are mine. La Lotta made individual servings - the quantity below makes 10-11 pots but you can make a single large dish if you prefer. Make up your strong coffee, add the liqueur and leave to cool. If it does not have time to cool at room temperature before you are ready to use it, either put it in the fridge or cool the container over ice. 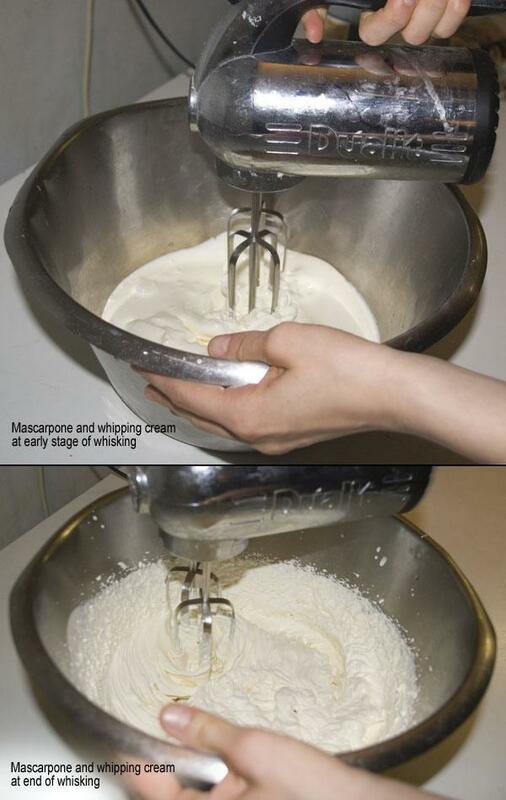 In your largest bowl mix together the mascarpone and the whipping cream. Whisk these together until extremely thick, pausing part way to add in the vanilla essence. Don't stop whisking until you can turn the bowl on it's side without the mixture slipping or falling out. This will take several minutes with a high-speed electric whisk. Once done, store in the fridge until needed. Separate egg yolks and whites into two separate mixing bowls. The bowl for the egg whites should be spotless and dry. Whisk the egg yolks until the colour becomes paler and the consistency is that of mayonnaise. Add approximately 2 ½ heaped dessert spoons of the icing sugar and whisk again until the mixture is thicker and hangs thickly off the whisk or a spoon. Put to one side. Clean and dry the whisk. Add the pinch of salt to the egg whites and whisk until white and stiff. Add approximately 3 heaped dessert spoons of the icing sugar. Whisk further the mixture is silky white and the bowl can be turned upside down without the mixture slipping or falling out. Pour the egg yolk mix into the egg white mix and combine thoroughly but carefully by hand. Don't beat too hard as you want to retain the air you whisked in earlier. Retrive the mascarpone and whipping cream mixture from the fridge, pour in the egg mixture and combine thoroughly but carefully by hand, as above. Divide half the egg, cream and mascarpone mixture between the individual pots. Tap each pot sharply on the table surface to get rid of any trapped air. Break each Savoiardi biscuit in half. 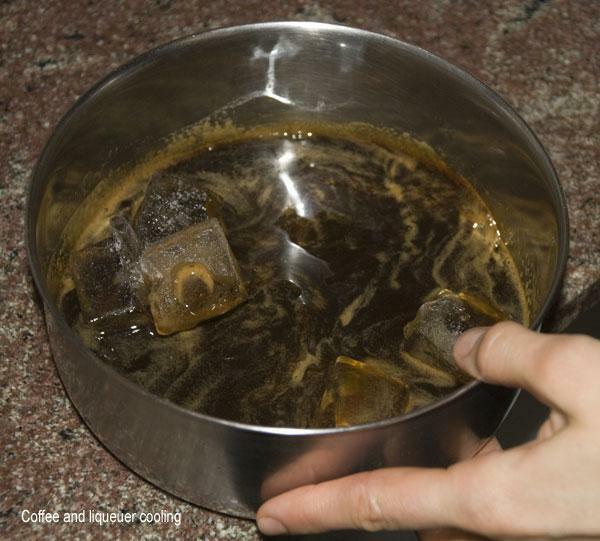 Dip each piece into the coffee and liqueur. Turn upside down if necessary to ensure that the liquid soaks in from all sides. Place three halves into each pot. Top up the pots with the other half of the egg, cream and mascarpone mixture. Tap each pot sharply on the table surface again to get rid of any trapped air. Cover each pot with clingfilm and leave in the fridge to firm up. This tiramisu is best 1-2 days after making and lasts for up to a week. Keep refrigerated until shortly before serving. Sprinkle chocolate powder over surface just before serving. Although the recipe as provided by La Lotta suggests using 8 Savoiardi biscuits, we used 12 to create a single layer of sponge biscuits between two layers of cream in one large dish. This worked fine but we felt it could do with more sponge to cream. Next time we make this we will use 24 biscuits to create two layers between 3 layers of cream. We will increase volume of coffee and liqueurs appropriately. For the liqueur use whichever liqueur(s) you feel go well with coffee. La Lotta commonly combine Amaretto and Tia Maria when making this recipe. They also recommend Borsci San Marzano but this can be difficult to obtain outside Italy. We made this using Amaretto and Tia Maria and the taste was spot on. The amount of icing sugar depends on how bitter your coffee and chosen liqueurs are and how much you would like to offset that in the cream. The amount of vanilla essence depends on how strong your brand of essence is and how much you would like the flavour to come through. As this dish contains uncooked eggs it may be unsuitable for pregnant women, young children and anyone with fragile health.